Let’s not be so self-righteous. 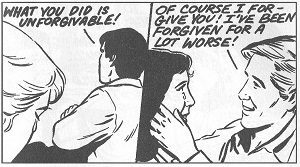 If you’re going to be so self-righteous and holier-than-thou and hypocritical as to think you’re better than somebody because they have sinned against you, but oh, no, you’ve never sinned, therefore you’re not going to forgive them, then you are the biggest sinner of all! If you have self-righteous feelings of being better than others and look down on them, like the Pharisee who said, “God, I thank You that I am not like other men” (Luke 18:9–14), then that attitude in itself is the worse sin. In fact, self-righteousness is one of the greatest sins of all. We should take a kind, loving, sympathetic, and forgiving attitude toward others and have mercy as we want mercy. We should treat others in their errors as we want God to treat us in ours. We must forgive those who’ve wronged us, seek forgiveness of those we’ve wronged, and then take them back into our circle of love and fellowship. May we all be kinder, more humble, more patient, more loving, more forgiving, and more long-suffering with each other—and may we sincerely pray, “Forgive us our sins, for we also forgive everyone who sins against us” (Luke 11:4 NIV).